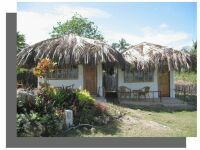 Our latest additions to the accommodation at the resort are these more traditional style Villas. Made of more local materials they are stand alone buildings all with sea views. As you walk in you will see the bamboo style beds and furniture which blends in very well with the building style. They have a separate bathroom and toilet giving complete privacy to the guest. Out front you have a patio with outside furniture where you can relax during the day our evening. These are priced to suit those who want to pay a little less however still be at a top class resort.